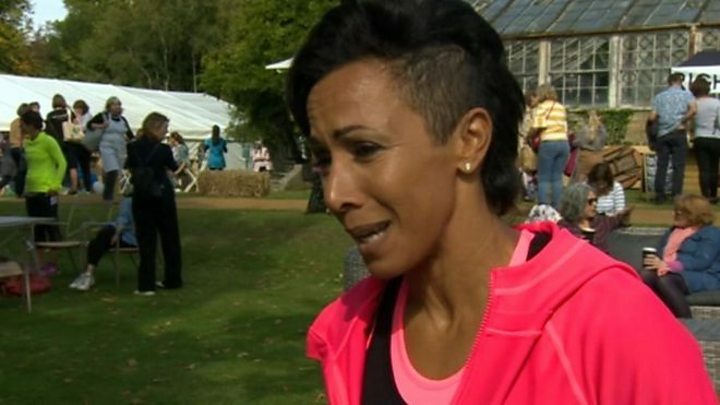 Olympic champion Dame Kelly Holmes has spoken of how she self-harmed as she struggled to overcome injuries she thought would end her career. Dame Kelly, who lives in Kent, won gold in the 800m and 1,500m competitions in Athens in 2004. She said just a year earlier she was "cutting" herself regularly "to release the anguish" she experienced. Dame Kelly said: "At my lowest, I was cutting myself with scissors every day that I was injured." She opened up about her experience with depression at the new Health and Wellbeing Live show near Tonbridge on Saturday. At the event, Dame Kelly shared an image taken immediately after an injury during the world championships in 1997. It was one of seven injuries that led her to self-harm. Dame Kelly, who joined the army at 17 before becoming an athlete, has previously spoken of how she hid her depression for fear of negativity but said it needed to be "shouted about more". Speaking to BBC South East, she said after "ups and downs for so many years" she got to the point where she looked in the mirror and "didn't want to be here". She added: "The scissors were in the bathroom and I used them to release the anguish that I had. It was really a bad place to be. "But my biggest message to people is that you can get out of that and you can still achieve. "There is always a light at the end of the tunnel." Becky Randall, co-founder of Health & Wellbeing Live, said: "[Kelly] struggled but she kept going. "So many of us are inhibited by a black cloud that sometimes descends, by feeling not good enough. "I want people to be able to understand that they are not alone and that talking about it is what really helps. It's got to be out there." Twitter users have been quick to praise Dame Kelly for being so open about her experiences. Mental health charity Mind says people generally self-harm as a way of dealing with difficult feelings, memories or situations. It says people who self-harm should seek support and treatment, such as the help of a GP, therapy, support groups and treatment for scarring.